Summer, 2015, a pediatrician from Vietnam spent one month shadowing one of my facilities’ Developmental Pediatricians. As part of her UVA Children’s Hospital experience she observed therapy sessions, including a Social Skills Group that I co-created and co-lead with an OT colleague. I shared with Dr. Trang that I had a trip planned with my daughter to Vietnam in December/January. 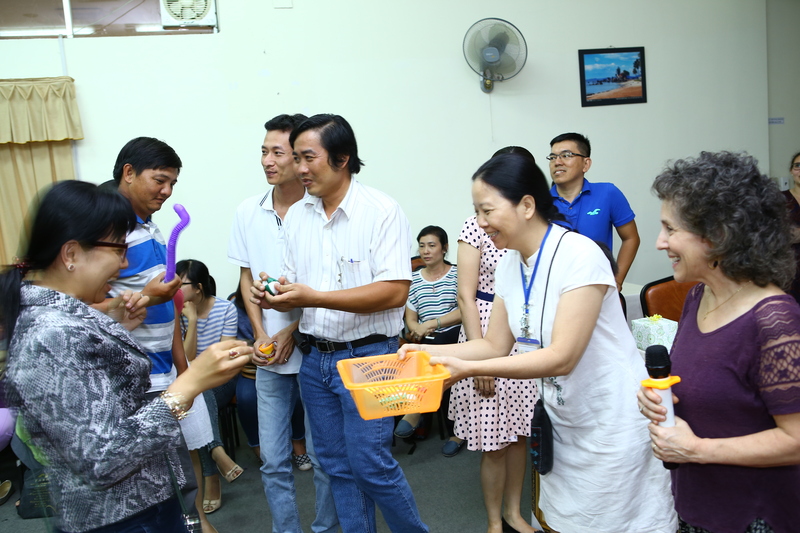 She told me about the LIVE WITH AUTISM club for parents and teachers of children with autism in southern Vietnam. She also spoke about the absence of occupational therapy in Vietnam and the desperate need for more education and training in managing this patient population. I then agreed to travel to Ho Chi Minh City to offer some type of training to the LIVE WITH AUTISM club during my travels in Vietnam. Was the group receptive to the idea of using yoga with their kids? Yes! This group loved the yoga session and seemed quite eager to use these techniques with their children. Do you feel that this 1 day of training was enough to empower the parents/teachers to use yoga therapeutically with their kids? Unfortunately, no. I believe that I gave a good introduction to the benefits and practice of involving children in a therapeutic yoga experience. However, this style of practice was very foreign to the participants, and I feel certain that they need further training and support. 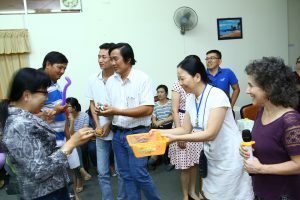 I would love to return to Vietnam to do further specific hands-on training with the LIVE WITH AUTISM club (and perhaps other groups). It would be amazing to coordinate a trip with other PYTI (professional yoga therapy institute) trained healthcare professionals to offer a multidisciplinary training and spread the benefit. What inspired you to work with children with special needs? I feel as though my mother raised me to do this work! She was a school teacher with a special interest and training in Special Education. From the time I was 6 years old, I was my mother’s side-kick for her volunteer work. During my first experience I fulfilled the role as inspirational playmate and motivator with a 3 year old child with CP. Thanks to mom, I later was a volunteer tutor for a girl who was legally blind. And finally, my mother (who was volunteering at a camp for children with disabilities at the time) introduced me to a pediatric OT who helped me realize I could pursue this as a fun and rewarding career. I aim to expand this work to other developing nations and populations! The video has been created with “voice over” for translation. Therefore, the same video can be created with other languages. This video will ideally accompany visits to other nations, with training workshops offered. Providing a video will help participants review what they have learned in the workshop and can aid in implementing these techniques into the home or classroom environment. What is the obstacle to my dream? You guessed it – money! Donate here to support this project. All donations are tax deductible. About the Author Ruth Goldeen graduated from University of Pennsylvania with a BS in Occupational Therapy in 1981. She later completed a M.Ed. in Early Childhood Education with a Special Needs emphasis, at the University of Virginia. Ruth has worked as a Pediatric OT for over 30 years and during the last 16 years has included yoga as an integral part of her treatment. She graduated from the Professional Yoga Therapy Institute in 2017. proyogatherapy.org. Ruth currently works in the Pediatric Outpatient services at UVA Medical Center. *I have several goals as a yoga teacher for children with Special Needs. I aim to help each child experience nervous system regulation, striving to achieve calm/focus at the beginning of the class, working up to active/playful, and returning to calm/quiet for the end. Of course, we also work on the physical benefits of a yoga practice, including flexibility, strengthening, body awareness, and motor coordination. In the cognitive domain, the children must listen, follow instructions, and have opportunities to work on skills such as sequencing and memory. We also address social and communication skills through “child friendly” activities and set-up. For instance, I prefer to have the mats set up in a circle, and encourage “all eyes on me” or upon a particular participant during games where children have opportunities to lead a pose. We play a yoga name game which offers practice with introducing oneself and remembering the names of others. We create yoga stories and play a variety of other games that allow fun practice with yoga poses as well as controlled interaction with others. For deep relaxation at the end of practice I like to cover the children with lightweight scarves and read a meditative story. Many of these children have difficulty calming and falling asleep at night so practicing the skill of relaxing and calming while being read to can be very valuable.